My friend and I started off with amazing pedicures….complete with paraffin wax. I got a cool lilac color for spring and this cool design on my big toes. I took pictures to show you all, but The Husband said I shouldn’t put my feet in my food blog LOL. If you want see, let me know and I’ll post – they look so neat (Yes, just like the Beav says). The pizza was so good that we decided to split a mini Spinach and Artichoke Pizza for starters. 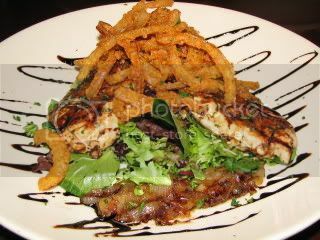 I debated a vegetarain entree (hello loaded garden veggie baked potato or pasta), but, when I read the description of the Balsamic Glazed Chicken over Mixed Greens I knew I had to get it. This was probably one of the most amazing dishes I’ve ever had. I ate 1 chicken breast, all the greens and onions (two types – marinated in balsamic & crispy ones) plus about 1/2 my white cheddar mashed potatoes. Look how perfect the chicken was cooked. 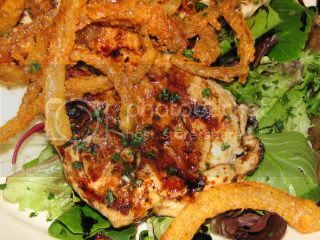 I am definitely going to use my other chicken breast on a salad to recreate this. I could have easily polished off this dish, but, decided it was better to not stuff myself and to have leftovers another day (that is unless The Husband steals it). This afternoon before our pedicure I snacked on some WW BBQ Pretzel Thins. 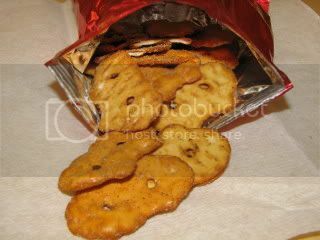 They are so yummy, crunchy and salty for only 100 calories. I feel so amazing now ~ My feet are pretty and pampered, my belly is full and now I am back at home getting ready to spoil The Husband with a massage. I figured I owe him since today is our 4 month anniversary and I went out without him. This was just what I needed to end my week and kickoff my weekend on the right foot (no pun intended). The Husband has funs plans for us tomorrow, but, it’s a surprise…can’t wait to find out what it is. Yum the chicken looks delicious, hope you have a great time tomorrow! 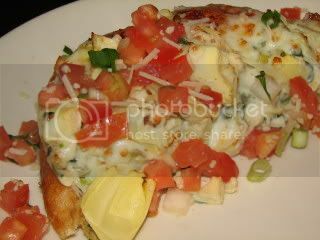 Kirwin ~ Most definitely – I am completely going on a quest to figure this dish out. Priyanka ~ Thanks, I’ll be sure to tell you all about whatever we end up doing.